My oldest has a birthday that is quickly approaching, and she’s been asking for LEGO blocks for months. She sees those cute commercials on TV for the Lego Friends blocks, but I really don’t think she’s ready for those. She has never been into blocks before– ever– which made me assume that she would struggle building with traditional LEGOs. I had pretty much told her several weeks ago that she could count on not receiving any LEGOs for her birthday, so you can imagine her surprise when I gave her an early birthday present of LEGO building blocks. Did I have a change of heart, you ask? Nope, I simply discovered the LEGO JUNIORS line! LEGO JUNIORS is targeted for children aged 4-7. They were a perfect introduction into the world of LEGOS for my daughter. When we opened the boxes, the blocks were neatly divided into appropriate bags. 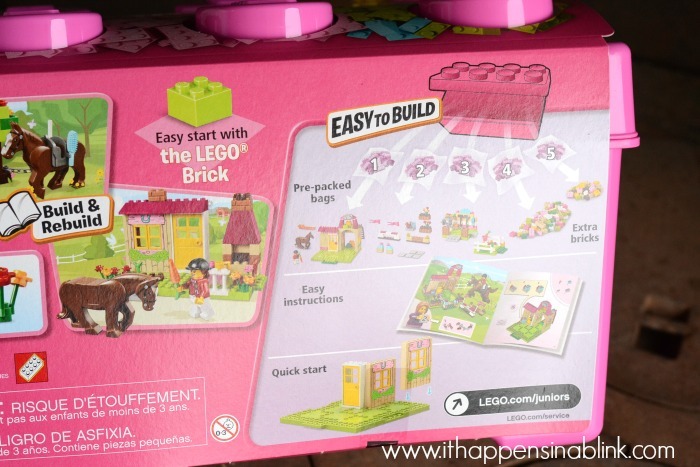 Each box of blocks comes with step-by-step instruction manuals and numbered bags. 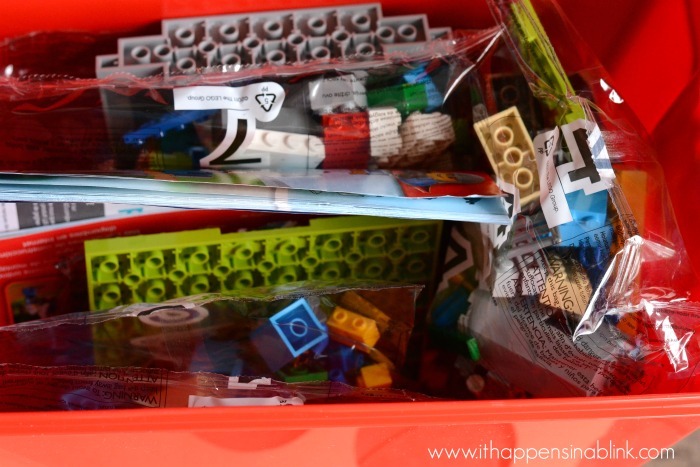 The bags coordinate with the booklets, allowing the child to follow along and build according to the booklet.I was surprised at how quickly my daughter was able to jump in and start building. I started her off with a brief explanation, and then she was a busy building bee for the next hour! My daughter has a “Type A” personality, so she was determined to build the sets by the book. She left no stone unturned when it came to perfecting her creations. 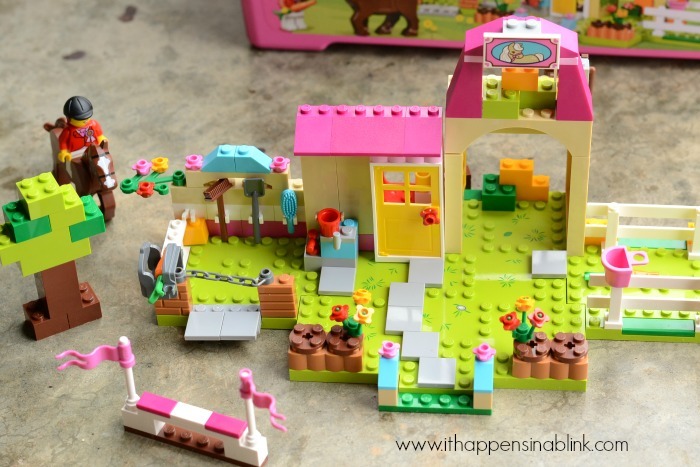 After building the complete Pony Farm, she did branch out and add a few personalized accessories- additional steps, etc. As she grew imaginative enough to add her own creative touch, I could see the confidence in her own building skills blooming right before my eyes. We had a few visitors over the next day or so, and she dragged them all into the playroom to show off what she had made. 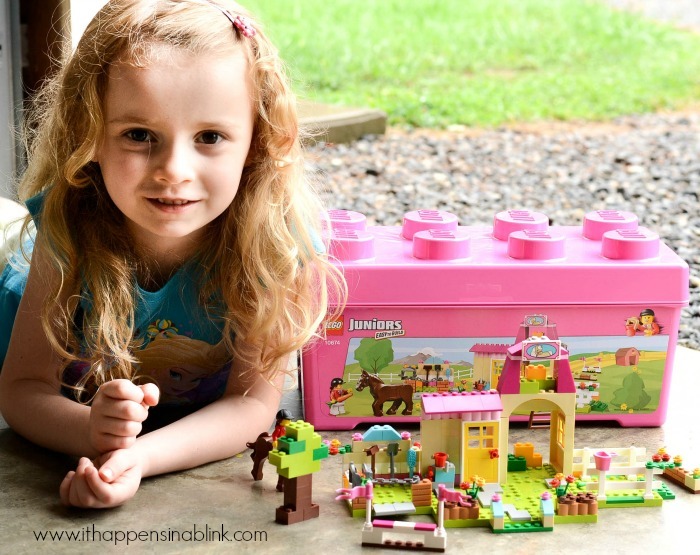 She enjoyed bringing the Pony Farm to life, and she has plans to build the castle so that the “princess horse rider” has a “knight” to protect her. Sometimes our house gets loud and crazy when the boys are upset, and I’ve noticed her carting her LEGO JUNIORS out to the back deck or the garage so that she can “concentrate” on building. I am glad that she has a new appreciation for LEGOS and is finding another way to express her creativity. 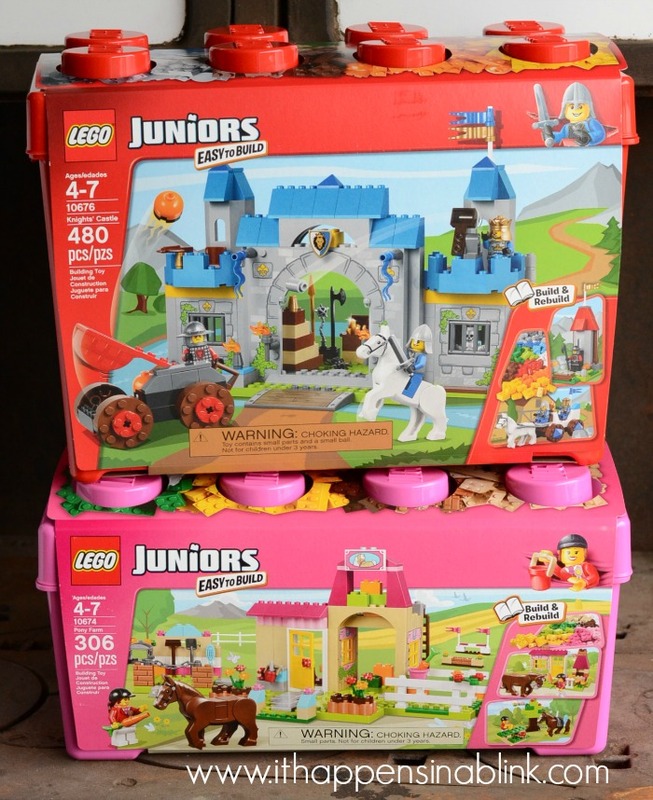 Do you know a little one who would like LEGO JUNIORS for an upcoming occasion or birthday? Girl, I love me some Lego’s! Absolutely my favorite toy growing up. (Don’t tell, but I’d still play with them if we had some.) 🙂 Love the Junior sets, too. So cute! That looks just about the right level of difficulty for my girls. We are just stepping into the world of Lego, and I’d love for the girls to be able to do it themselves without me having to complete every step. I’m going to check this out! Great birthday present….or it’s not too early to start thinking about Christmas! how fun! legos are the best! These are truly age appropriate for the targeted age group. So fun!! We LOVE Legos here in the Artsy house…in fact, we were building just this afternoon. Is it weird that I secretly want the girly LEGO set? I love the printable gift tag too! I cannot wait until my son is old enough not to eat them, because my daughter LOVES to build. She’s just not a fan of cleaning up yet haha – so we have to wait just a little longer. These sets look awesome. Legos were my absolute favorite toy as a kid. These would be so perfect for my youngest- he gets too easily frustrated with more complicated sets. 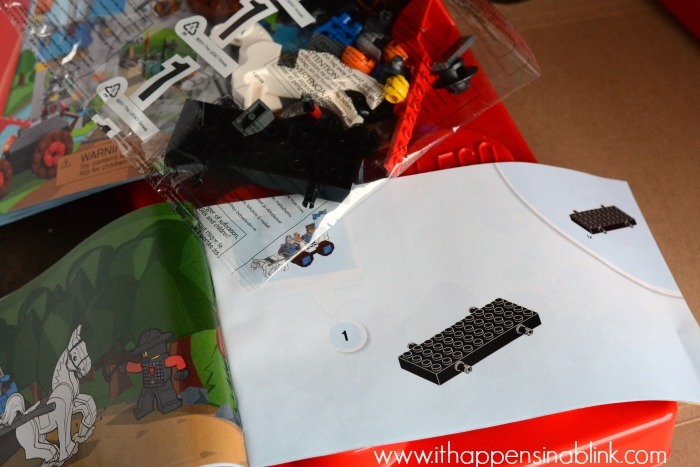 Thanks for printable always- legos are a quick, perfect birthday gift! Legos are such a fun toy for EVERYONE! My guys LOVED playing with legos and would do so for hours on end!